I kind of feel like I've fallen off the edge of the world the last couple months. We spent two months in the States and have been back in Tena for almost two weeks. But getting here was so hectic that we really needed some time to recover. Our flight from Miami was delayed a total of four hours, three of which we spent sitting on the airplane. If that wasn't bad enough, we got to Quito to find that none of our checked baggage had arrived. After waiting in a huge line (because hardly anyone on our flight had received their bags) we found out that our bags were on the next flight from Miami. Our bags were some of the last to come out of that plane, but at least they were there. I had friends meeting us in Quito and felt so bad that they had to wait for us so long. We were supposed to arrive in Quito at 7 pm, but after the delay and the bag ordeal we walked out of the airport at 1 am. Even after all of that, I am thrilled to be back in Ecuador. We have gotten back into our routine pretty quickly. This year we've add homeschooling to the routine. We are joining up with another family from the US who also homeschool their daughter. So far it's been working out great! Personally, all of my income is from US institutions, so I basically "work" in the States. But what if you are earning money from work you do in Ecuador? This concerns me, because my husband plans to work in Ecuador in the near future and I'm afraid things are going to get complicated. All US citizens and permanent residents are required to pay income tax on all income (whether made inside or out of the country). See the article submited to my site by TaxesforExpats.com to understand this law better. Tena is becoming more and more popular. If you're thinking to move to Tena, check out our latest listing. This beautiful home is located in one of the most upscale neighborhoods in Tena. 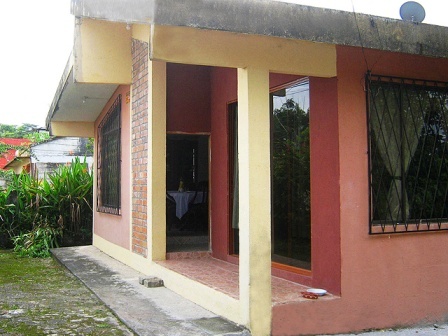 House has three bedrooms and includes a one bedroom apartment, all on a large lot. I've received several additions to my directory over the last couple of months. One hotel stands out, probably because a friend of mine stayed there and said it was amazing. Next time you're in Baños check out the Casa Verde Hotel and go green! My photo contest has kind of come to a standstill. So if your holding on to a beautiful photo of Ecuador, don't forget to share it with us. The year is coming to a close and I'd like to have one more winner in the running for Photo of the Year.